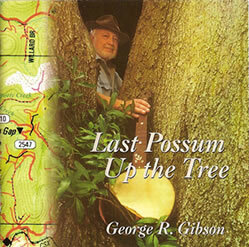 The Possum CD contains some of the banjo songs and stories I learned as a boy in the Kentucky mountains ca. 1950. I was born in 1938 at Bath, in Knott County, Kentucky. Bath was a rural post office, now discontinued, on Little Carr Creek, which was known by local people as Burgey’s Creek. I learned to play and sing the old songs, in the old tunings, from my family and neighbors. I left Knott County in the 1960's, taking with me a Kay banjo and a Vega Whyte Laydie guitar banjo. I have been mostly a couch banjo player since leaving. I believe that continuing to play banjo was my way of holding on to a past that I glimpsed only briefly. That past is part of a world and time in Knott County that has vanished forever. As far as I know, I am the last person left playing the old Burgey’s Creek banjo music. I am the last possum up the tree. A few academics and revival musicians from outside the mountains wrote the banjo out of existence in pre-Civil War Appalachia. This is one example of cultural strip mining that I thought should be reversed. Therefore, when I was afforded the opportunity to write the liner notes for the Possum CD, I included evidence of a banjo tradition in Kentucky prior to the Civil War. Most of the banjo songs were played on a ca. 1907 Bacon ff Professional 5-string banjo. Tracks 7 and 20 were recorded playing a ca. 1924 Gibson GB-4 trap-door guitar banjo, which has a 14" head. The words to the various songs on the Possum CD can be found on this web site. The Possum CD can be ordered by contacting us. The price is $17.00, which includes shipping in the continental United States. The money from the sale of this CD will be donated to WMMT-FM Radio and the Cowan Creek Mountain Music School. This CD can also be ordered from Appalshop or Elderly Instruments.